Size: ca. H 1 m x W 1m x D 1m. 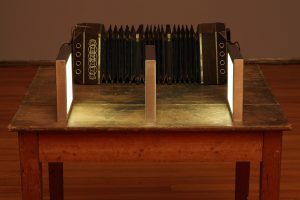 Technique: Installation with three light-boxes and one bandoneón placed on an old and worn table. Video documentation: Ante Verbum (2011). Ante Verbum is a small installation, a ‘stilleben’ of contemplative origin which expresses my reflections regarding memory, the uprooting from a place and the actuality of the term ‘nostalgia’. 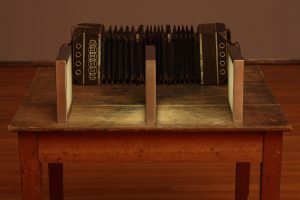 Three light-boxes are placed parallel to an old and non-functional bandoneón, an instrument that has the musical characteristic of creating sound when the keyboard is pressed and the air is compressed and expanded in its bellows. 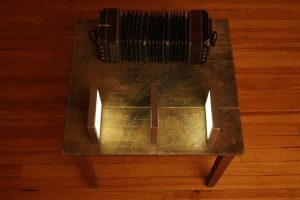 Both the bandoneón and the light-boxes are placed on an old and worn table. 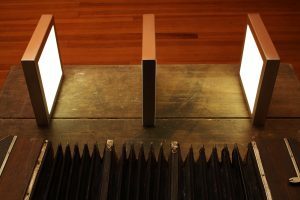 The three light sources modulate the work’s cadence: the two external boxes are illuminated for a few seconds only towards the surface which is directed towards the inside where one has the central box. The light which the two external boxes emit synchronically increases and decreases and, at the moment in which they go out, the central box simultaneously lights up. The latter is lit for a few seconds on both sides and, in this way, communicates with both the external boxes. The sequence is repeated ad infinitum. The light sources give new life to the architecture of the bandoneón, an instrument which historically emigrated from Europe to South America and which precisely due to its history was an object used by the emigrants/immigrants in order to awaken memories of origins, long gone places and past emotions. 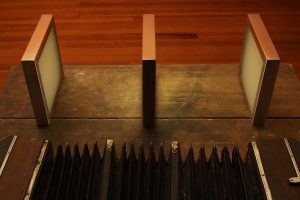 Besides referring to the movement of the air inside the bellows of the bandoneón, the presence of the three light sources provokes a sort of perceptive shifting. The sound is transcribed in light and expresses a type of communication which comes prior to that of language.